Classic Freddie and the Dreamers Band Concert Posters and Memorabilia! Buy Online Now! Freddie & the Dreamers were the clowns of the British Invasion, playing their pop music for laughs while the other groups of the time were dead serious. Lead singer Freddie Garrity began playing in skiffle groups in the late ’50s, switching to rock & roll in the early ’60s. After the Beatles broke the American market wide open, Freddie & the Dreamers followed in the flood of acts that tried to duplicate the overwhelming success of the Fab Four. The group’s hits were more numerous in the U.K. than in America, where they had only one Top Ten hit, the number one “I’m Telling You Now.” As 1965 turned into 1966, the group stopped charting in the U.S. and the hits began to dwindle in the U.K.; by 1968 the original group disbanded. Garrity later assembled new versions of the Dreamers, and the group toured for two decades; however, Garrity‘s health began to decline and he became acutely ill on a plane from New York to Britain in 2001, reportedly due to emphysema. Subsequently often confined to a wheelchair, he died in Bangor, Wales, on May 19, 2006 at the age of 69. 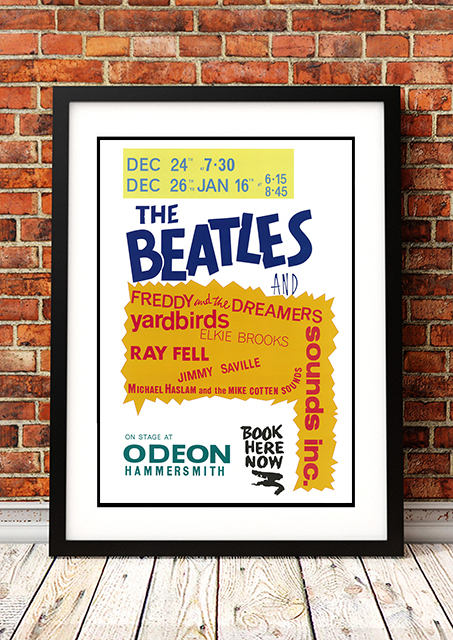 We stock some awesome Freddie and the Dreamers Band Concert Posters.